Happy Thanksgiving Eve and welcome to the Wednesday Hodgepodge! If you've answered the questions on your own blog add your link at the end of my post, then go say hello to your neighbor. Grateful for many things, the community here being one of them. Thanks for playing along here today and every Wednesday. 1. What's something you might say runs in your family? Hmmm...blue eyes? Chattiness? Our skills with a knife? The women in my family are known for our clumsiness with a knife. Hubs says I'm not allowed to use sharp instruments when he's away. 2. I read here a list of ten things you should do before 2017 arrives (in less than six weeks! )...which tasks on the list might you do? What would you add to your own 'before the year ends' list? I have a dental appointment scheduled, we're cleaning as we unpack boxes and also donating many items to charity, I'm sure I'll tell someone I love them, compliment a stranger, and will think about the new year. We watch the sunrise most mornings so I've got that one covered. I'll be traveling in January to a couple of places I've never been before, but nothing between now and the end of 2016. I do need to get a handle on my inbox and photos, so that's going on the to-do list for sure. I don't think I'll write myself a letter, but I blog and keep a journal which serves a similar purpose. What would I add? I'm going to say take some time to enjoy this new space. We've been going great guns since we moved in, and I'd like a breather before the new year rolls around. 3. What's something other generations (not your own) misunderstand about your generation? We're still young on the inside. 4. Sweet potato casserole, mashed potatoes and gravy, cornbread dressing-which would you miss the most if it weren't on the holiday dinner menu? Cornbread dressing for sure, with mashed potatoes coming in a close second. Thanksgiving is about the only time we have dressing and I look forward to it every year. Mashed potatoes aren't on our regular menu rotation either, so that would be my runner up answer. I bake sweet potatoes fairly often. Probably logistics for the next couple of days. Even my lists have lists. What goes in the oven when? Who sleeps where? What do I need to pick up when I make my seven millionth trip to the store? Alrighty then. I'm going with 'hip'. So collards-yay or nay? Or never had em? 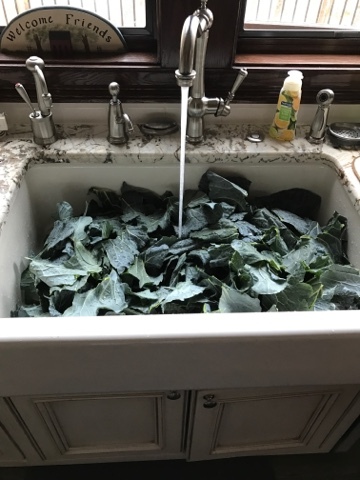 Definitely a southern thing, and we've got a sink full. My daughter's in-laws have a bumper crop so hubs went over there today and picked some to add to our Thanksgiving menu. My mom loves them and was happy to hear it. Daughter1's father-in-law even gave hubs some hog jowl to add to the pot. I'm from NJ, but I still think that's the secret to delicious collards. They wilt down like spinach, but still we've got plenty. We cook ours with a little water, chicken broth, and tarragon vinegar and then add a pinch of red pepper flakes for good measure. I told hubs he needed to cook them today because a house needs to smell like turkey and dressing on Thanksgiving Day, not vinegar. Also I loooove my great big farmhouse sink. Your skills with a knife ?? Better stay out of your kitchen, lol ! Great set of questions Joyce. I love making lists too and mine often become like tree diagrams with lots of things branching off. Hope you have a lovely thanksgiving with all your guests and then yes a breather sounds good! I've never had collard greens, but don't think I'd like them since I don't like most dark green leafy vegetables. I wish I did though because they are super healthy for you. Your farmhouse sink is gorgeous. Happy Thanksgiving to you and your family! Collards... my southern hubby loves them. I have cooked them a few times but they won't be on our TD table! ha My sis-in-law is making the traditional green bean casserole! Thanksgiving is that one day to eat everything with dairy in it - milk, cheese, cream... no holding back. Happy Thanksgiving Joyce! I am a southern girl and love collard greens! With me being a vegan now, I have to do without the ham hocks. I recently learned that I have brittle bones. A bad thing indeed at my age. Collards have a lot of calcium, so I suspect that I'm about to become an expert at cooking them...once I get back on my feet, that is. Happy Thanksgiving to you, my friend. We've grown collards in the past, but I don't cook them. (Our son-in-law does, though!) My favorite of 'the greens' is mustard greens, which we'll be having tomorrow. Joyce, I really appreciate your taking time to host, today, considering all you have going on! I hope your first Thanksgiving in your new home will be one of your best, ever. Happy Thanksgiving. You're speaking my language on the collards. And the hog jowl. It's just so dang hard to get all the sand out of them. My mother can clean fresh collards better than anyone I know. Not a grain in a single bite! :) So excited for your first Thanksgiving in your new home! Wow, that's a lot of collards. I used to cook them more often, when I was trying to make sure all the little children got their B vitamins, but I've pretty much given up on it. Love what I see of your completed kitchen! That's a great answer for #3, being young on the inside! My family doesn't care for sweet potatoes so on Thanksgiving I bake just a few like a baked potato. I also make them often during the year. I hear you on your lists having lists!!! I wondered what was in your gorgeous sink. I've never had them. Happy Thanksgiving and what a beautiful blessing to be in your new home. Your answer to #5 made me laugh. I know how it goes. Our life this week is like one big tile game for the same reasons that you mention. Have a very blessed and Happy Thanksgiving! Collard greens. We don't have them for Thanksgiving. Where would we put them on the plate? But we ALWAYS have collards, black-eyed peas, and ham for New Years Day. This is a must have here in the South. You have a great acrostic and I like collards, too!